Born to missionary parents and raised in Liberia, West Africa, Csaba feels more at home in Africa than in the USA. He is an elder of Christ Church in Moscow, Idaho and was commissioned by her for the work of Bible Translation. Csaba has a B.S. in Wildlife management from the University of Idaho. He also did graduate level studies in linguistics and translation. Lisa is a full time wife and mother although she also has a B.S. in Wildlife management from the University of Idaho and did some graduate level courses in linguistics. Most of her time on the field was spent in teaching their four children and keeping Csaba balanced. Read her book “At the edge of the village”, published by Canon Press, to see how she spent the rest of her time on the field. Hans was born in Illinois and was six months old when Csaba and Lisa took him off to begin their French studies in Vichy, France for two years. Noai, which means “mediator” in the Kpelle language of Liberia, was born in France. Andreas and Jeremiah were born in Ferkéssédougou, Côte d’Ivoire and have Bakwé middle names (Yaou and Yepi). 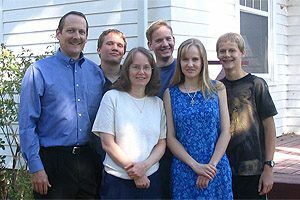 Currently the Leidenfrosts are based in Moscow, Idaho where they have a home, and Csaba makes two trips per year out to the Bakwé to carry on the translation work. Csaba can work full-time on the translation work with his Bakwé colleagues while he is in Moscow via the internet. Thank God for modern technology! While this is not ideal, it is necessary at this time because of Lisa’s health. When Lisa recovers from her chronic fatigue they do hope to return to living among the Bakwé. Hans graduated from the U of I in May with a degree in Mechanical Engineering. Noai is a junior at New St. Andrews College, in Moscow. Andreas will be a freshman at New St. Andrews in the fall. Jeremiah will start high school at Logos School in the fall! Living among the Bakwé was an important part of the Leidenfrost’s ministry as biblical teaching can be lived out in practical obedience to God’s Word. Daily interaction with the Bakwé also included getting involved with the community, helping them with their physical needs (health, medical, shelter, water, and community development projects). For photos of life in the village, click on In the Village.